If you have never been involved with preparing specimens or cultures to transport for diagnosis or further testing, you may not realize all that goes into packaging and shipping patient samples and cultures properly before transporting them out of your facility. Materials – including patient specimens and cultures – that are known to or could possibly contain an infectious agent are considered hazardous materials; the transport of hazardous materials like these is regulated by both US and international agencies. Training is required for anyone who affects the transport of hazardous materials by motor vehicle, air carrier or the US postal service. And, of course, carriers such as FedEx and UPS who transport those materials for us must also follow those regulations; in fact, they will return packages that have not been prepared or documented appropriately. Why does that matter? Delays in transport may result in specimen degradation and possible loss of viability of some cultured microorganisms. If people are unaware or choose to ignore those regulations, they are potentially delaying patients from receiving appropriate diagnosis and treatment. In addition, they are subject to fines from the Department of Transportation. Packaging and shipping regulations are subject to change whenever there is a need to address safety issues or adapt to changes that occur within the transport industry. Every year in January, I receive a flood of emails from people wanting to know about changes to packaging and shipping regulations that may be going into effect in the current year, and then again in December for information on changes made during the past year. So who am I? I primarily serve as a trainer and subject matter expert on US and international Division 6.2 hazardous materials regulations that apply to packaging human specimens, animal specimens and microbial cultures for transport. I’ve been consulting with public health agencies and the Association of Public Health Laboratories (APHL) since 2002. In an effort to provide information beyond my trainings, I’ll be writing blog posts here for those interested in regulatory changes and addressing challenges faced by others. 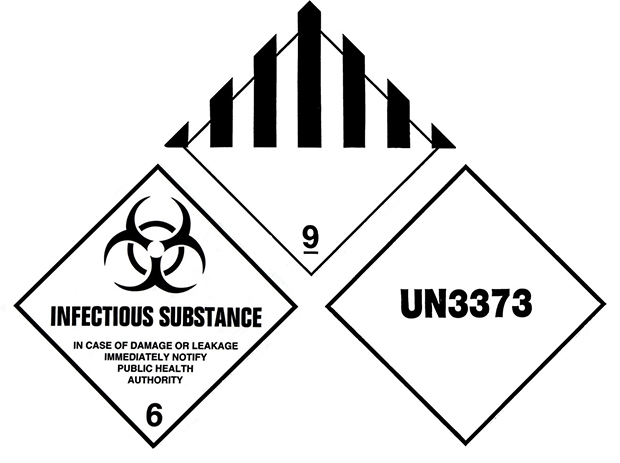 Neither the Department of Transportation (DOT) Hazardous Materials Regulations nor the 2016 International Air Transport Association (IATA) Dangerous Goods Regulations (57th Edition) have any changes that apply specifically to the packaging instructions for UN2814, UN2900 (i.e., Category A infectious substances), UN3373 (i.e., Category B infectious substances) or UN1845 (i.e., dry ice) dangerous goods. However, there are a number of new and revised operator variations that are attached to the packaging instructions for those dangerous goods. I do not think these changes will have any impact on the vast majority of shippers. A complete list of the operator variations that apply to FedEx and UPS are published on their respective websites and in the 57th Edition of the IATA Dangerous Goods Regulations. While not specific to infectious substances, DOT and IATA have increased in the height requirement for the word “OVERPACK” to at least 12 mm on some packaging. Although most packaging and label vendors have started converting to the new size, the packaging used for category A or B infectious substances can be labeled with the current text height of at least 6 mm to at least 12mm. Select agents are not accepted. Net quantity per package must not exceed passenger aircraft limit (e.g., 50 gm or 50 ml). Three copies of a completed shipper’s declaration form are required. Use UPS WorldShip® software; only by contract may you use other software. Service is restricted to origins and destinations in the U.S.
Category B (UN3373), exempt human specimens and exempt animal specimens are accepted for transport by either “highway and rail” or “air” modes. Genetically modified micro-organisms (UN3245) with an origin and/or destination outside the U.S. are not accepted in UPS small package services. Risk Group 4 agents are not accepted. Three copies of a completed shipper’s declaration form are required; two of the three must be printed in color with the red diagonal hatch mark border. Use FedEx Ship Manager or other approved software. Please know that APHL is working closely with CDC to address the potential gaps posed by federal policy changes on the shipment of select agents. For more information regarding FedEx and UPS policies for shipping patient specimens and cultures, please contact your local FedEx or UPS office or their hazardous materials/dangerous goods hotline. Please leave any comments or questions below. I will respond to as many as I can, and will address common questions in future blog posts. Please help us to find the online DOT/PHMSA HAZMAT training module. Do you know if the new course digipak is available, yet? Hi Kevin — Please see Pat’s response below. Thanks! One link to the DOT Security Awareness training module is http://www.phmsa.dot.gov/staticfiles/PHMSA/Hazmat/digipak/training_module.html .